Located near Nelspruit’s CBD, HPTwelve Accommodation (Hendrik Potgieter street 12), will welcome you to a clean, comfortable and spacious stay. Each of the three units (one family unit) has a dedicated, secured parking spot, private entrance and private en-suite bathroom stocked with free amenities and crisp white linen and towels. Air Conditioning and a ceiling fan will keep the Lowveld heat at bay.With the well-renowned Busamed Hospital and other medical facilities- literally around the corner, you will be close to loved ones in medical need. Free Wi-Fi and a kitchenette stocked with a Continental style breakfast and (good) coffee, will prepare you for business or pleasure- depending why you are visiting the beautiful Lowveld. 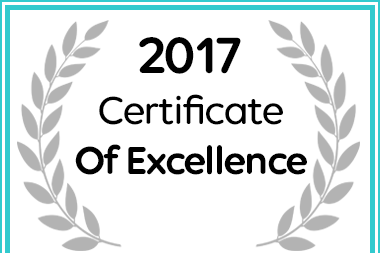 In recognition of exceptional service HPTwelve Accommodation in Nelspruit has been awarded a Certificate of Excellence. View Free Frozen Mojito voucher for each night booked!